Terry has booked a flight out for Friday and has asked me to close all windows and air vents in the apartment as there are new fears of exposure to radiation (see below). No evacuation order in our area but officials did widen the Fukushima zone from a 20 km to a 30 km radius (still far away from central Tokyo). More and more people we know -- including friends who just yesterday said they saw no reason to leave Tokyo -- are now on the road to Osaka with hopes of flying out to Hong Kong or UK later in the week, for fear that if they wait it will be increasingly difficult to get to Narita to catch a plane. The boys and I are leaving for New York tomorrow, not because we believe we are in danger if we stay in Tokyo, but school's out, due to uncertain power supply; we will drive Terry crazy if we stay (he's staying to work) and his company is paying for our flights. ... I wasn't worried. I am a bit worried now. But I am not going to post about it. Let me be clear. I am a huge fan of FB, and it's been a great communications tool when phone calls and texts weren't getting through, but the News Feed is an echo chamber of misinformation and general freak-out, and I see no reason to add to it. I would say, though, that I want my husband to get outta Dodge, only because as more and more people try to leave, it will be more and more difficult for him to do so, and I don't want him to get stuck. AT AN 11am news conference this morning in Tokyo, Naoto Kan, Japan’s prime minister, announced that elevated levels of nuclear radiation emanating from the Fukushima power plant pose a substantial risk to human life in the area. He urged people within 30 kilometres of the site to stay indoors. Early Tuesday morning an explosion damaged the No. 2 reactor at the Daiichi plant in Fukushima; this is at least the fourth time that an explosion has affected some part of the multi-reactor plant since the a 9.0-magnitude earthquake and tsunami struck on Friday afternoon. This time part of the reactor itself seems to have been damaged. Crew that were tending to the facility and trying to make repairs were evacuated. They had already punched a hole into the vessel around the second reactor, so as to reduce the risk of further hydrogen explosions—at the cost of releasing a greater flow of radioactive particles into the surrounding atmosphere. The No. 2 reactor is not the only source of concern. A fire broke out at Daiichi’s No. 4 reactor at about 6 o'clock this morning, about half an hour before the blast discussed by Mr Kan. The radiation level around that reactor too is high and rising. Yukio Edano, the chief cabinet secretary, says that the No. 4 reactor was not in operation when the fire started. That suggests that meltdown itself is not a possibility in that reactor, but there is nuclear fuel housed inside. Engineers suspect the explosion was a hydrogen-powered blast, like the ones that preceded it. If that is the case, the nuclear fuel should not be ignited. With the building's shielding ruptured however, some degree of radiation leakage was inevitable. The radiation level around the No. 3 reactor meanwhile has risen to 400 millisieverts (mSv): much higher than it had been when last reported and positively damaging to human health. Exposure to anything higher than 500 mSv, for however short a period, is recognised as being harmful. This nuclear accident is already the world's worst since the explosions and meltdown at Chernobyl, in Soviet Ukraine, in 1986. 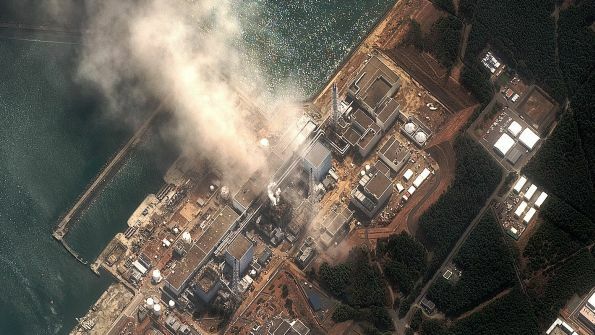 As it escalates rapidly, attention is swinging from the victims and survivors of the catastrophic tsunami damage along the coast to the horrifying possibility of yet greater dangers posed by the compromised reactors. Untold thousands of people in northern Japan have died since Friday. Today panicky e-mails about radiation cascade across East Asia, offering fear and bogus medical advice. The French embassy put out a safety alert to its nationals living in Tokyo, noting that south-westerly winds from the area around Fukushima could bring low-level radioactive contamination to the capital, 250km away, within 10 hours. While the Japanese response has been by and large stoical, foreigners are clearly giving thought to flight. Air China has cancelled scheduled flights to Tokyo from Beijing and Shanghai. Mr Kan and his colleagues are trying to reassure the public that the fight to contain the radiation is still on. Their approach has seemed marked by composure and candour. Mr Kan complained that he had not received information directly from the Tokyo Electric Power Company (Tepco) for more than one hour after he watched this morning's explosion on live television. Tepco has requested help at Fukushima from the American army.